Valentine Flowers with Chocolates – An Amazing Combo to Wish ‘Happy Valentine’! Want to confess your heartfelt feelings of love to sweetheart with something cheerful and delightful? Well in this regards, this is definitely the best place for you to be. 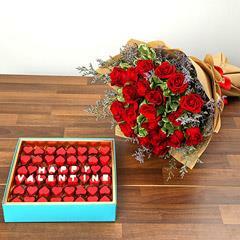 In the above-offered range, we at Flowerdeliveryuae.ae offering this wide range of Valentine Flowers with Chocolates. Being a delightful combo of beautiful flowers with delicious chocolates, it is sure to convey happiness and affectionate feelings of love to your beloved on the day of love. Moreover, with ample of choices, you get the ease to choose the best valentine gift combo from the range to meet your preference and budget. 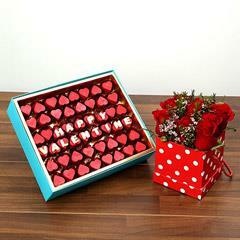 Now Onwards Buy and Send Flowers with Chocolate to Delight your UAE Residing Beloved! We understand your emotions of being parted with your beloved on the special day of Valentine celebration. Thus, at Flowerdeliveryuae.ae, you need not to feel upset anymore. Beside myriad offerings for Valentine Flowers with Chocolate Combos in varying prices and options, here we are also offering the ease to send Flowers with Chocolate to Dubai, Ajman, Abu Dhabi, Sharjah, Ras Al Khaimah and other locations of UAE. Additionally, we also offer facility of mid-night gifts delivery, same day gifts delivery and express gifts delivery in UAE. This way we help lovers to connect despite being miles apart from each other. Explore Here the Most Wonderful Selections for Valentine Flowers with Cake! 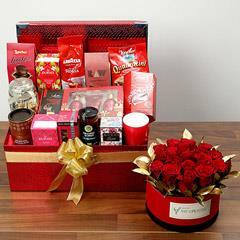 Considering the latest gifting trends and varying gifting preferences of people, this specific collection of Valentine Flowers with Chocolates have been created with great ease. There are delightful and wonderful choices for combos consisting romantic Valentine flowers of red roses, carnations, gerberas and more in glass vase arrangement, bouquets, bunches and glass vase arrangements too. Also, there are plentiful options for delightful chocolates like inclusion of assorted chocolates, popularly branded chocolates, heart shaped chocolates and much more to melt heart of the receiver. 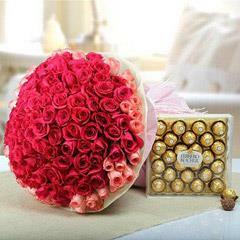 So, think no more, just order to send flowers with Chocolates to Dubai and across UAE to surprise beloved this time.